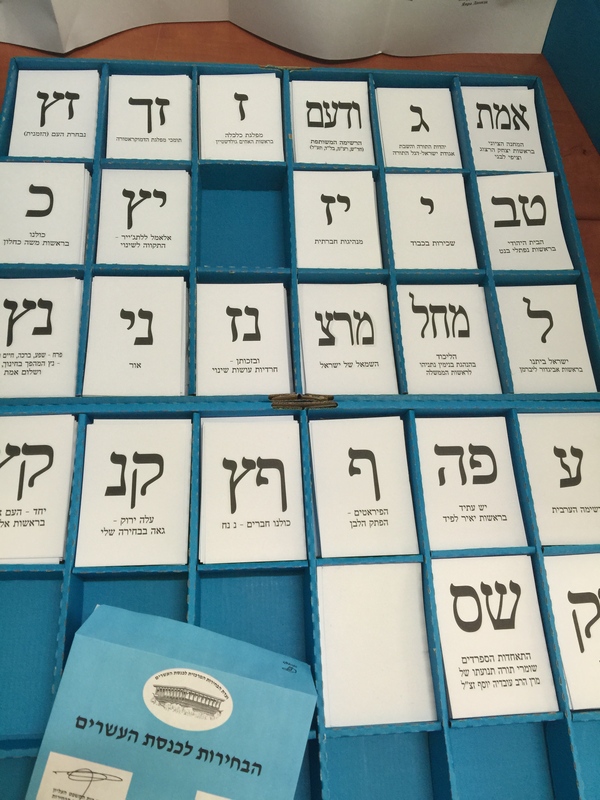 For spring break, I traveled to Israel, and I was privileged to witness the 2015 election fever firsthand. 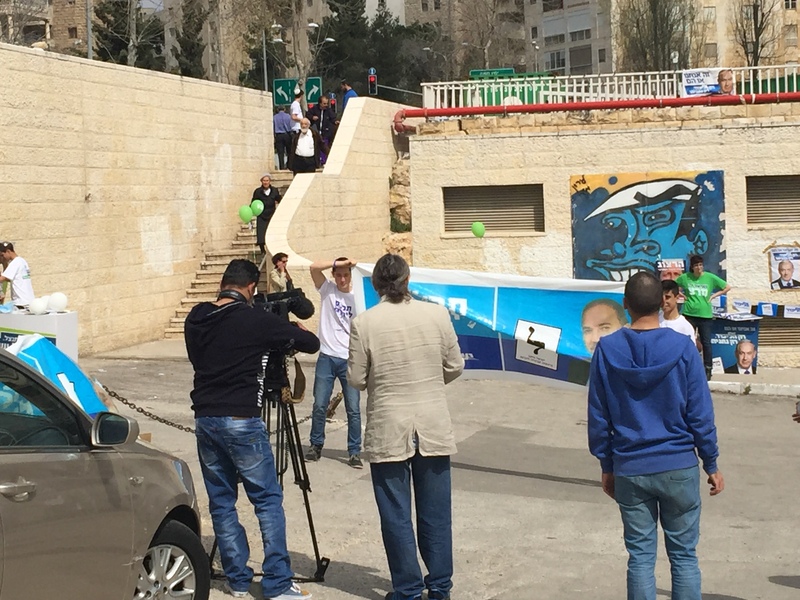 From cars decked out with streamers and flags to people campaigning ardently for their parties and candidates to voters heading to the booths on Election Day (March 17), the photos in this essay illustrate the excitement and political fervor of the Israeli electorate. This election in particular was an important one for Israel. Netanyahu presented to the U.S. Congress in the beginning of March on the importance of preventing a nuclear Iran. The left-wing parties all endorsed platforms focused on social reform and domestic issues. Thus, as usual, the right and the left each took up their respective mantles: security and social welfare. 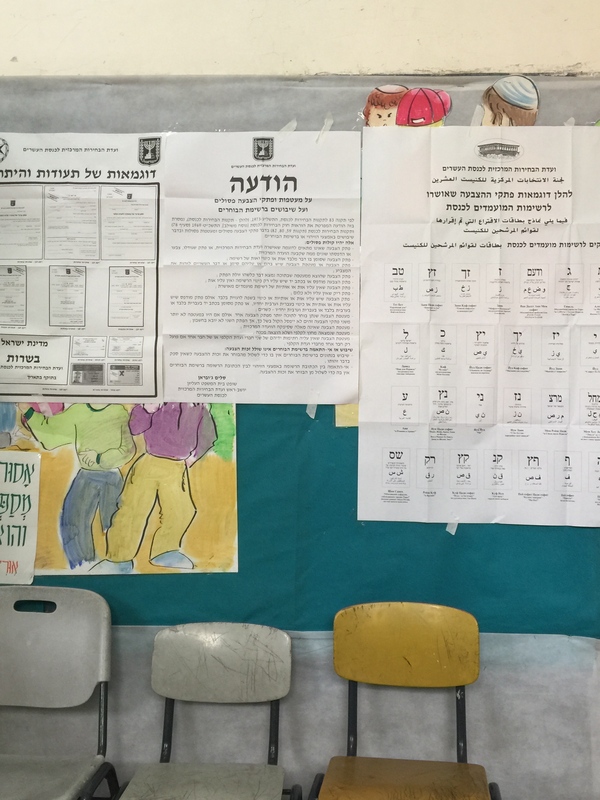 But aside from the clear divide in Israeli society, this election saw the largest turnout of Arab-Israeli voters. Their voice and their preference led their party to outstanding election gains. In Israel, the country runs on the parliamentary system. As such, although there is a candidate at the head of the party, the population votes for a particular party rather than for an individual. Some people vote for a particular party because of individual candidates and their records. Others may vote based on party issues and platforms. For example, Ale Yarok’s (Green Leaves) major platform was legalizing marijuana. They did not get any mandates, otherwise known as government seats. By contrast, those who voted for Likud, Benjamin Netanyahu’s party, may have done so because of Netanyahu’s past acts and their belief in his strength as a Prime Minister. The two major parties in the election were the left-wing Zionist Union, led by Isaac Herzog and Tzippi Livni, and the right-wing Likud party. Additionally, the Habayit Hayehudi, another right-wing party led by Naftali Bennett, and the Joint List, the Arab-Israeli party led by Ayman Odeh, were also strong contenders. For more information on each of the parties, check out this great resource. Unlike in the United States, people get really into the election spirit in Israel. They hang banners everywhere, hand out pamphlets and flyers and even dance and sing in the streets. On Monday evening, March 16, I went to have dinner with a friend in Mahane Yehuda, a market in the center of Jerusalem. As we were eating, a group of young men began singing and dancing in the middle of the street outside the restaurant. One was waving a flag and the other young men were grouped around him with their arms around each other jumping. I have never witnessed anything like that in the United States. One of the most incredible things about Israel is how passionate the population is. I spent the majority of my time in the center of Jerusalem and as such I did not make my way to East Jerusalem or to any of the Arab villages throughout the country. 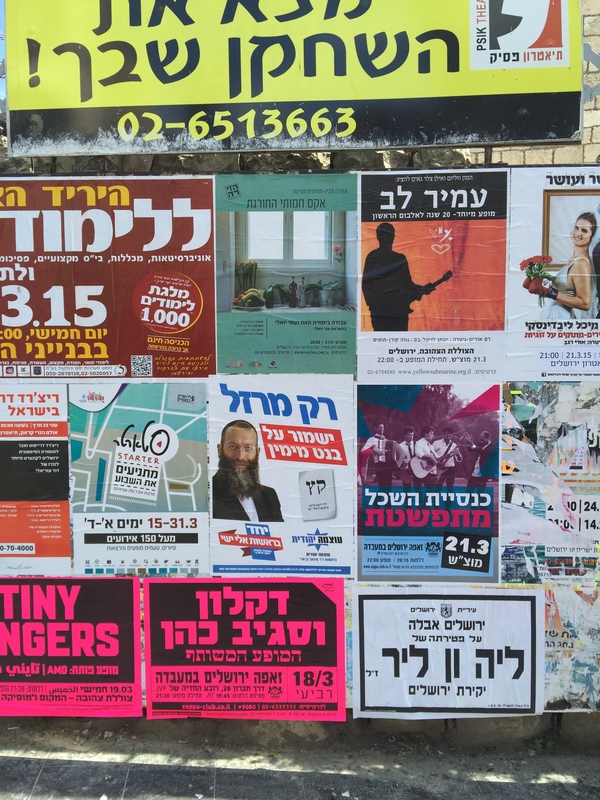 I was unable to take pictures of the Arab-Israelis voting or of any of the banners, flyers or pamphlets the candidates handed out to entice people to vote. Despite a lack of photos in this piece, Arab voters played an important role in this election. In record-breaking proportions, the Joint List, which is the party representing the Arab-Israeli community, gained 13 mandates, making it the third largest party in government. This may be a controversial statement, for both the right and the left, but I firmly believe that the more involved each segment of the population becomes in politics, the closer the country will come to peace. The more Arab-Israelis and other minority groups in Israel begin to feel heard and a part of both the society and nation, the more likely peace will come. On Yaffo Street, a beautiful street where the light rail runs and no cars can drive, there are a number of cafes, restaurants and stores. 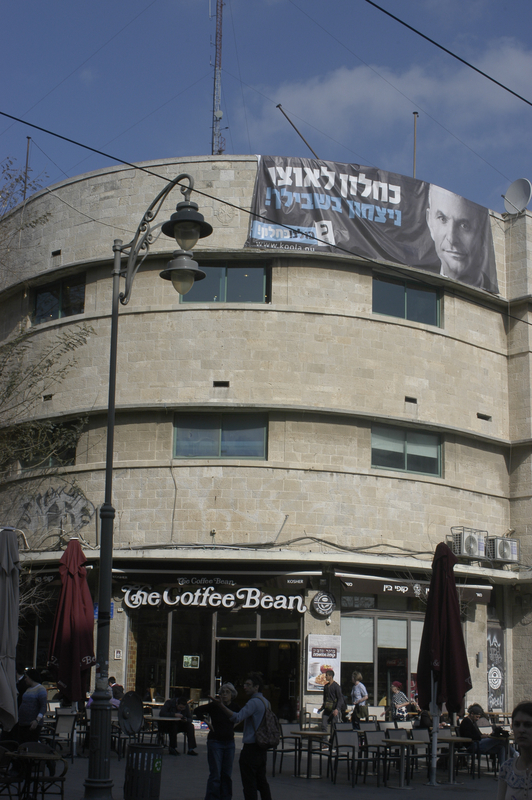 Above “The Coffee Bean” building, someone hung up a poster for Moshe Kahlon’s party, Kulanu (All of Us). The slogan for the party is “A Win for You.” Some call him the “Kingmaker” because his mandate of 10 seats could make or break a right-wing or left-wing coalition. He has yet to align himself with a party. 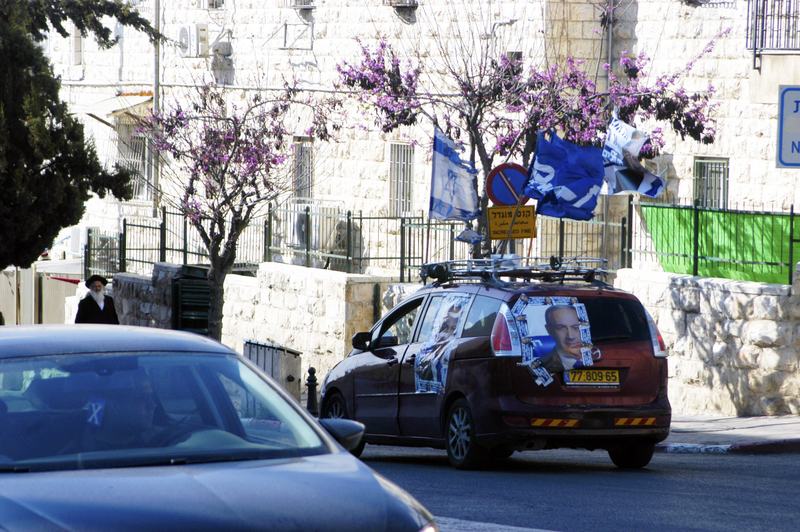 As I was walking down one of the main streets in Jerusalem, I noticed a car covered in Likud paraphernalia. Along with the Likud flag, and a poster of Netanyahu’s face, the owners of the car attached an Israeli flag to the top of the car. Many people in t-shirts of their respective parties walked the streets in the days before the election handing out flyers. 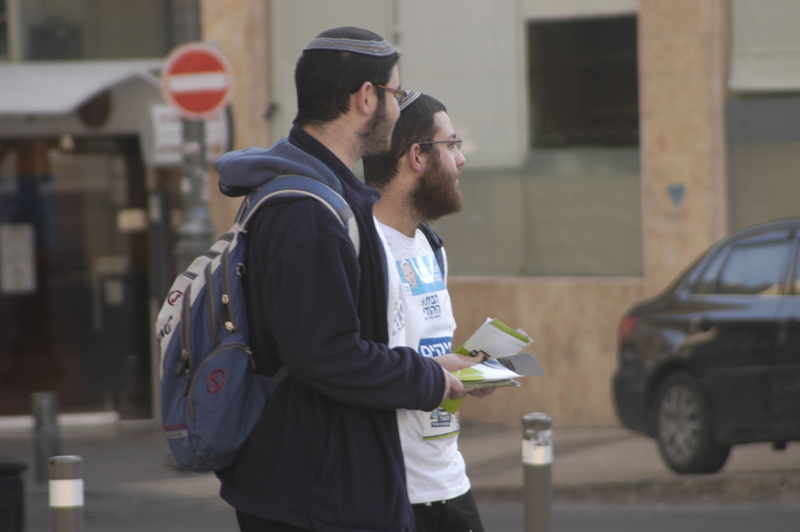 The men above were handing out flyers for Habayit Hayehudi. In front of one of the voting centers, a number of party supporters set up posters and even little tables. 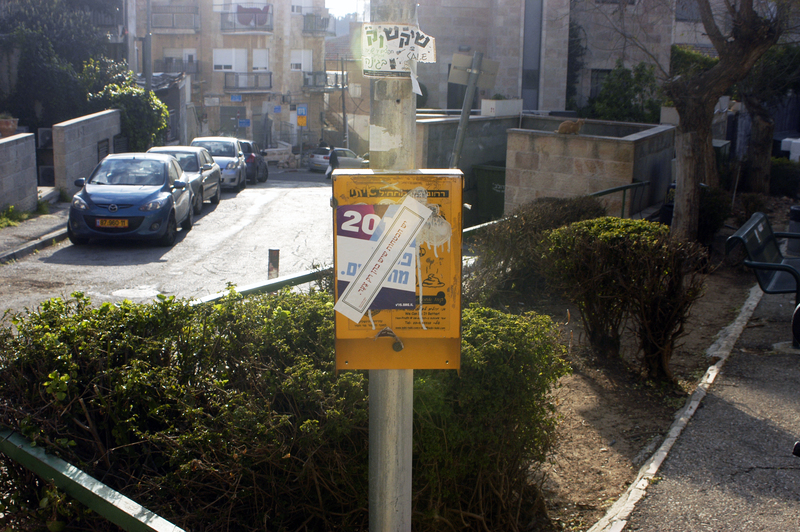 For example, here Likud set up a small booth with copies of the tickets people use to place their votes and pamphlets in order to encourage people to vote. “Only Likud, only Netanyahu” reads their slogan with a copy of the ticket name “Machal” and a picture of Netanyahu. 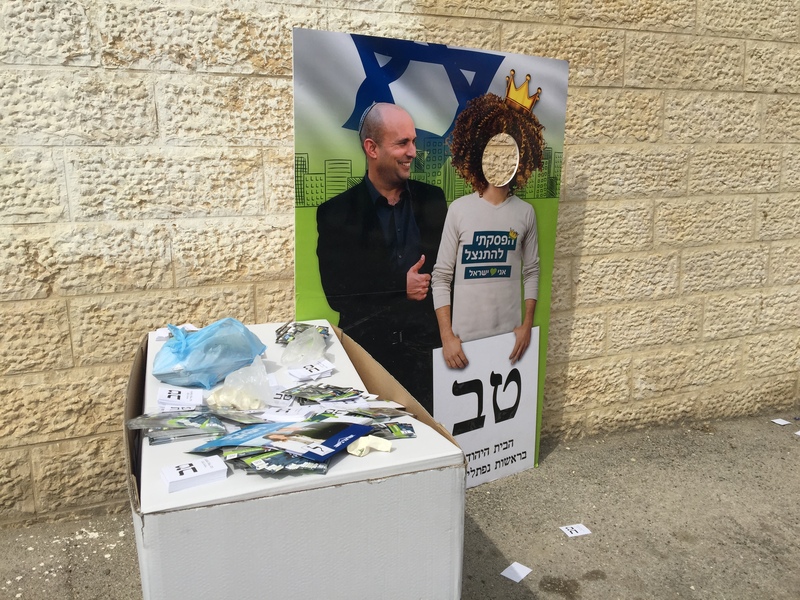 Next to the Netanyahu table stands a picture of Naftali Bennett with a cut-out where anyone can put their head and take a picture with the politician. On the empty face’s shirt reads the slogan for Bennett’s party, Habayit Hayehudi (The Jewish Home), “I stopped apologizing.” Bennett won only 8 mandates this election, partially because many of his supporters feared Netanyahu would lose the election and voted for Netanyahu instead to solidify a right-wing government. Camera crews and people of all faiths and beliefs turned out to vote. This poster features the Israel Beiteinu (Israel, our Home) party. In the background an individual in a green Meretz t-shirt, one of the left-wing parties, which won four mandates, stands next to a Likud table. 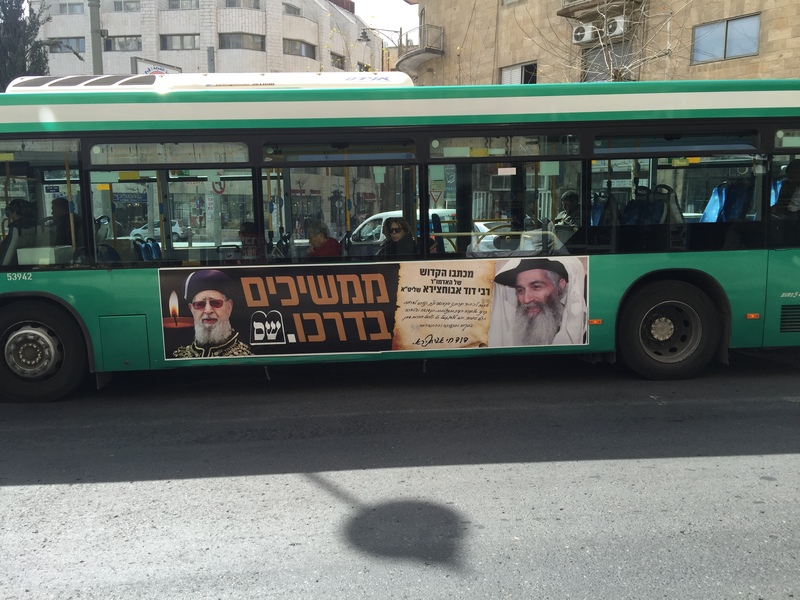 I have never seen slogans like this on American buses, but in Israel, it is common practice for parties to buy space on buses for their posters. Above is a picture of the Shas party, a right wing Ultra-Orthodox Jewish party. Their slogan, “Continuing on his Path,” refers to the leadership of a Rabbi from the community who recently passed away and who was a prominent member of the party. This yellow box distributes bags to clean up after dogs. Two election campaign stickers sit on top of on another. Voting takes place in schools, like in the United States. On the board next to one of the voting rooms is a notice with instructions and a list of the parties and their symbols. The list is in Hebrew, Arabic and Russian, the three most spoken languages in Israel. Zahava Moerdler is a Staff Writer for Rights Wire. 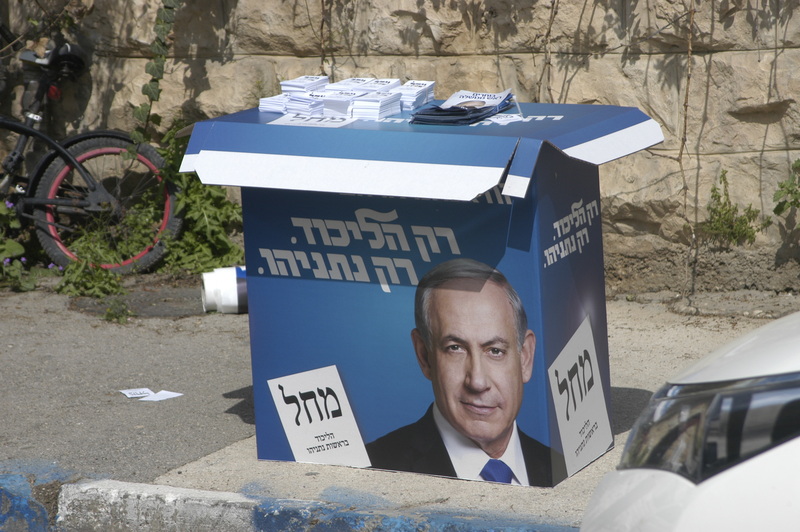 Categories: Israel | Tags: Elections, Israel | Permalink.